Files can be recovered from your computer's recycle bin. Protect your privacy with this easy to use file shredder that shreds data so it can't be recovered. 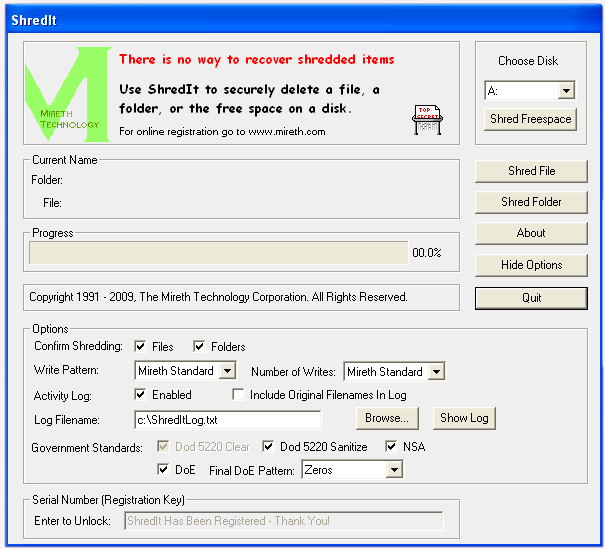 Whether you want to erase a hard drive or wipe a file, ShredIt for Windows is the computer privacy software for the job. It shreds files, folders, disk free space, hard drives and external hard drives. It comes with step-by-step instructions, built in safety features, government overwrite standards compliance - DoD, DoE, NSA - and a configurable overwrite pattern. ACAT Pro is an advanced file cataloging utility. It can be a real lifesaver for anyone who doesn't store data in one place. Why look through each data CD to find a file you need? Use ACAT Pro to catalog its contents. It's 100% FREE to try! Sitekeeper 3.5 provides the essential tools necessary to manage the systems on your networks without the complexity, expense or bloat youÃ¢â‚¬â„¢ve come to expect from systems management software. Total Commander is a file manager replacement for Windows. Features: Drag&Drop from and to explorer/desktop. Packer shell for ZIP/ARJ/LHA/RAR/UC2/TAR/GZ/CAB/ACE. Command line, full text search also in packed files, button bar,FTP client. Total Commander 16 bit (former Wincmd) is a file manager replacement for Windows 3.1 (32bit available separately) Features: Packer shell for ZIP/ARJ/LHA/RAR/UC2/TAR/GZ. Command line, full text search also in packed files, button bar, FTP client. Delete invalid Files - is a Windows Utility that you can use to delete files and folders that you are not able to delete using the standard Windows Delete function. New version includes a function to Scan for Invalid and too-Long Names. NoClone is a true dupicate file finder that can helps user to instanly find true duplicate files, duplicate folders, duplicate images,duplicate mp3 and dupcliate outlook emails, what' more, which also can find a large amount of similar images. Copy Cat 2.0 actually skip the bytes which are not readable from file and copy all other bytes therefore it extracts max data which is normally not done by windows copy operation. WinMerge is a tool for visual difference display and merging, for both files and directories. Unicode support. Flexible syntax coloring editor. Windows Shell integration. Regexp filtering. Side-by-side line diff. Highlights differences inside lines. File Commander helps you save time when organizing the files on your disk. If you find that you're moving, copying, or deleting the same files over and over, you can use File Commander to make a simple command that does it for you. Package any digital content for online delivery - from digital artwork to complete software installations. Packages can be created in any language and secured with passwords, electronic signatures. License agreements can be shown before unpacking. This site does not contain serial number, crack, keygen ShredIt for Windows serial number : serial number is the simplest type of crack. A serial number(cdkey,product key,etc) is register the program as you may already know. a crack or keygen may contain harmful software. If you cannot find the exact version you want, just give it a try. for more information read .nfo/.txt/.diz file include in zipped file.